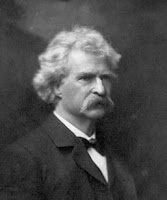 I love the Mark Twain quote, and right now I'm thinking about 2 former bosses of mine. Yeah, we *thought* the one guy was dumb, but the next one made him look really smart. Over the years, I am finally learning to keep the mouth shut. Finally. Took a while, though. Swallowed my foot a lot. After years offending everyone in sight I have learned to keep my mouth shut. Now if someone truly annoys me I just punch them in the face. One of my favorite quotes. As to your question, I seem to do both. Ticks me off, LOL. Oh, I suffer from foot-in-mouth disease. Years ago, friends of my husband's had a baby. They called to tell me they'd had a boy. "What's his name?" I asked. I laughed. "No, really, what did you name him?" They haven't spoken to us since. Oh, yeah, there's no doubt in anybody's mind by the time I'm done flapping my gums. I prefer to call it "clarity". Sadly, I am good at not only sharing inappropriate comments and keepig appropriate comments to myself. Thank God none of my friends have a kid named Aloysius. Oh, yeah, I do both. I'm working on it but bad habits die hard. Twain was always good for a one-liner! I unfortunately do both but more regret the things I've left unsaid. Great quote ... it's advice I should follow more often. I could tell you about it. LOL, that's a great quote!